Many plants thrive in soil rich in nitrogen. As they decompose, coffee grounds release nitrogen, potassium, phosphorus, and other minerals. This is a guide about plants that like coffee grounds. I read that you can give coffee and the grounds to plants. Does anyone have a list of plants that I can use coffee? I'm glad you asked this question. Most gardeners assume that because it's slightly acidic, fresh coffee grounds or leftover brewed coffee can be sprinkled over the soil of any acid-loving plant. Not true. It's actually a bit more complicated than that. First of all, not all acid-loving plants are created equal. Plants like Azaleas, Gardenias,Hydrangeas, Roses, Rhododendrons, and Blueberries all seem to respond well when grounds are mixed in with their soil. Acid-loving African Violets, on the other hand, do not. Most edible garden crops also prefer slightly acidic soil, but adding coffee grounds also seems to affect them in different ways. For example, lettuce seems to benefit greatly from the addition of coffee grounds, but tomatoes are actually affected somewhat negatively. Plant scientists are not exactly sure why some acid-loving plants respond differently to fresh grounds than others, but it could be because coffee contains allelopathic chemicals that actually inhibit growth in some plants. This might be helpful when you're trying to control weeds, but unfortunately, coffee grounds can't tell the difference between the plants you like and the plants you don't. Secondly, mixing fresh grounds in with the soil has a tendency to tie up some of the nitrogen while the grounds decompose. Once the fresh grounds are fully broken down, however, a modest amount of nitrogen is released back into the soil. Mixing small amounts into the soil probably won't affect your plant's nitrogen uptake too much, but it's still better to add the grounds after they have fully decomposed or just sprinkle a small amount on top of the soil. 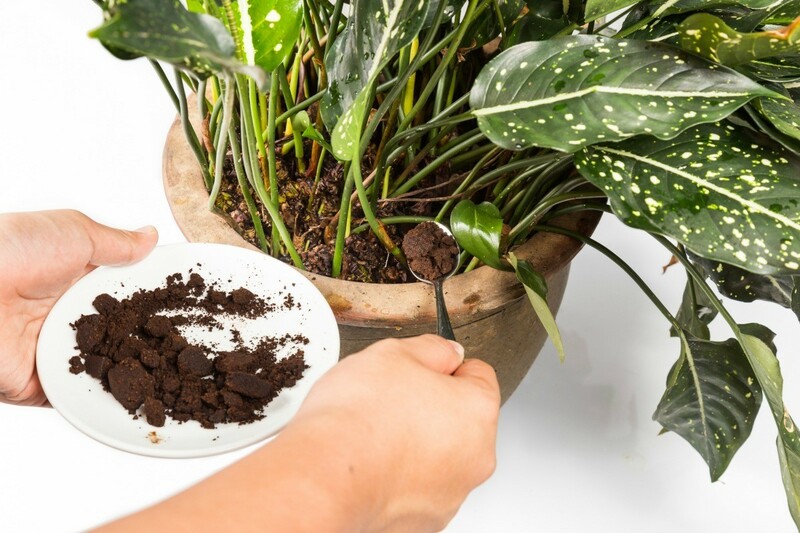 Finally, a word of caution on using coffee grounds for houseplants: Moist grounds encourage fungus growth that can be detrimental to your plants. If you use them on houseplants, do so sparingly and avoid watering your plants unless the soil is dry to the touch. Unfortunately, there's no real recipe for how much is too much. Your safest best is to add leftover coffee and used grounds to the compost pile (it's unlikely you could add too much). If you don't compost, you'll have to rely on trial and error. A cup or two around shrubs and a tablespoon or two around potted plants now and then should do no harm. Because coffee is somewhat acidic, adding grass or leaves (browns) as mulch can help neutralize its acidic affects around plants that prefer more alkaline soil. Which plants like coffee grounds? Just to let everyone know, I have 75 tomato plants in pots. They are doing great, 3 ft. tall and growing. I used coffee grounds and organic fish and bat guano. Everything in my garden is organic, including the dirt. 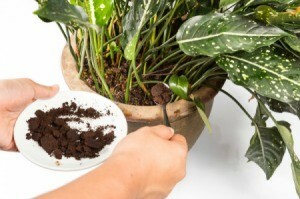 Can I use coffee grounds on my house plants? I have a Christmas catus and a climbing plant that I am not sure what it is, other than it has large waxy leaves. I hate to throw them out and I can't compost them because I live in a apartment. You can put a sprinkling of the grounds around your plants. There are different opinions about using coffee grounds on house plants but most agree that using them outside (not heavy quantity in one place) is a good thing. Since you live in an apartment I see no reason why coffee grounds would be okay to use but do as Judy says and just sprinkle them on top of soil and not on the plants or the stems. Be sure to "sprinkle" as too much may become moldy. Remember, coffee grounds added does not take the place of a regular schedule for fertilize. A word of caution on using coffee grounds for houseplants: Moist grounds encourage fungus growth that can be detrimental to your plants. If you use them on houseplants, do so sparingly and avoid watering your plants unless the soil is dry to the touch. Also, very weak black coffee/tea can be added (small quantities) to many plants as this seems to benefit my house plants more than coffee grounds. This question has been asked on ThriftyFun before so here is a link that you might like to check out. My best advice is not to add too much to indoor plants because they will definitely get moldy. I found this out the hard way :) If you use it, dig it in deep. It will be great. So many terrific answers and good advice! My two cents? If you're looking for (additional) natural fertilizer, visit a local greenhouse and ask about worm castings. Coffee ground is coffee beans (seeds) that have been roasted, not roasted to the point of turning into coal but still roasted enough to resist decomposing just like wood coal doesn't decompose. It is better to leave it on the ground when used with plants. It does get molded but if you scratch the coffee ground to air it the mold goes and coffee ground is untouched, just like coal, it doesn't mold. And that is the big problem. I experienced putting a lot of coffee ground in the soil of an indoor plant. I saw the plant decline after a few months and decided to quickly changed the soil. The coffee ground was there, it had not mixed with soil and had not decomposed at all. So as the plant can only benefit of the azote, phosphore and potassium once coffee ground has decomposed and these elements have gone into water to be absorbed by the plant the benefit is not big but the risk to damage the plant roots by roting them is important. The coffee ground and the water around it really stank as sewer water. This is what I am doing since I had this bad experience : I put coffee ground around the foot of the plants in the garden to protect the plants from insects and snails. To use the azote, phosphore and potassium for my indoor plants I put the coffee ground in a bottle of water once it reaches the bottom of the bottle I water my plants with the water only and not with the coffee ground. When it doesn't colorate the water anymore I throw the coffee ground away and I put new one in. I only do it once a month and I only water the plant that are not cultivated for their flowers as main interest because is azote is the main element of coffee ground and azote is more useful to plants cultivated for the beauty of their leaves. You do not have this kind of problem with tea leaves because tea leaves have been dried only. They decompose quickly and give good results as well. I read about the tea leaves on plants and I'm interested, can it be used on any plant? On top of soil? I'm a newbie to gardening and I'm trying to figure out how to not kill plants and what is good for them... To stay alive. Great advice will definitely be back to read more tips!! Are coffee grounds good for oleander plants? If not what fertilizer is good for oleander plants? You dont need to fertilize them at all. Just dont overwater them. Oleanders are usually easy care plants but always remember that everything about this plant is poisonous so be careful when handling and keep away from children and pets. You do not say if your Oleander is an indoor or outdoor plant but an indoor plant usually requires more fertilizer than an outdoor plant. I would suggest that you always do research on newly acquired plants so you will know exactly what fertilizer they need as well as how to care for them. Coffee grounds can usually be used on plants that need more acidity but how to use them is important. I have always found that placing coffee grounds in a pail of water and leaving over night makes a very good "drink" for my plants and toss coffee grounds in my compost. Be sure to check the ph of your plants before adding coffee grounds. Oleanders like a pH-Value between 6 and 8.3 and a good fertilizer recommended is 15-30-15. Bone meal is an organic source of phosphorus and may be a better ingredient for your Oleanders than coffee grounds. If you need help with determining the ph of your soil I would recommend purchasing something like this as it has been well worth the cost to me. I have found web sites that will help you learn how to take care of your Oleander and find out when or if coffee grounds should be used with your plant. The best fertilizer for plants, that are showing pale leaves or sparse flowers, is 10-10-10 fertilizer applied during springtime and also when fall arrives. The fertilizer needs to be granular and applied at 1/2 cup per oleander shrub. You are absolutely right Cybergrannie to remind people that Oleander is a very dangerous plant. It is really the most important thing to say about Oleander. Every year there are cases of people being poisoned after using Oleander branches as sticks on a grill. It is even not advisable to have an Oleander indoors or to put it in a place in your garden where you usually stay for a long time. Some people will say that this is taking to much precautions but, the cardiac toxins of the Olander are well known but all its toxins are not yet known. Only 4mg of the plant is needed to kill and even the fume of the plant when it burns can kill. Just like the power of the venom of a snake in very early spring compared to its power in the middle of summer, the power of the toxins of a plant depends on the strength and development of the plant itself. So if you live in a zone which climate is so good for Oleander that they easily grow to 10 meters high, take this seriously : no Oleander indoors, and do not stay too long by their side. Thanks for stressing how dangerous all parts of this plant can be. It is nice to hear from you and I hope you and your loved ones are enjoying good health and lovely weather.